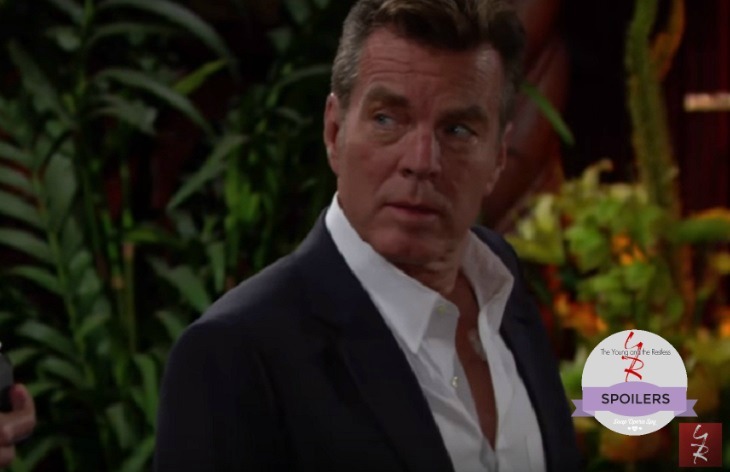 “The Young and the Restless” spoilers for Thursday, September 22, tease that Jack (Peter Bergman) and Billy (Jason Thompson) will face off as pandemonium erupts at the board meeting. In the office at the club, Jack refuses to listen to anyone who tries to talk him out of quitting. He says Billy is a lost cause and that made him lose faith in what this foundation stands for. Billy reminds Jack that he slept with Jill (Jess Walton) when she was with John (Jerry Douglas). He gripes about Jack playing the martyr. Billy insists that Jack’s marital problems are his own fault. He was busy trying to make amends with Victor (Eric Braeden). It drove Phyllis (Gina Tognoni) away. When Billy talks about Phyllis’ love, Jack flips out and tries to attack his brother. Related: Michael Roark Teases Travis Has “Things Beneath The Surface” – Secret Agenda? Neil (Kristoff St. John) and Devon (Bryton James) break things up. After Ashley (Eileen Davidson) leads Billy out, Hilary (Mishael Morgan) arrives and gets updates on Jack’s decision to leave the foundation. She offers to talk some sense into him. Lily (Christel Khalil) thinks Hilary is just resuming her climb up the social ladder, but Devon puts her in her place. Elsewhere, Nikki (Melody Thomas Scott) chats with Phyllis about Jack’s recent ranch visit. She’s concerned about Jack’s desire to do battle with Victor. Nikki is also afraid of any lingering revenge goals Phyllis might have. Phyllis suggests that those days are behind her. Vengeance has cost her too much already. Nikki shares her thoughts on rebuilding a marriage. She doesn’t think Phyllis should give up hope. At Brash and Sassy, Travis (Michael Roark) isn’t convinced that Victoria (Amelia Heinle) has entirely moved on. He feels like he needs to get his own place while Victoria sorts out her feelings. After Travis leaves, Nikki talks to Victoria about her relationship with Travis. Victoria admits that this whole Billy and Phyllis thing has been painful. She’s over Billy, but it’s hard to shut the door. Victoria believes Billy stopped her from fully moving forward with Travis. That’s something she regrets. Victoria feels like Travis truly understands her. Nikki urges Victoria to open up to Travis. Later, Victoria finds Travis packing up his belongings at home. She confesses that he was right about Billy holding her back, but she doesn’t need more time to figure any of this out. Victoria maintains that Billy is her past, but Travis is her future. She wants him to put everything back and stay. Travis is pleased by the “order.” Elsewhere, Hilary speaks with Jack privately. He doesn’t think she’s in any position to be dishing out advice. Hilary is a cheater, too. Jack doesn’t see how he can ever look at Billy and Phyllis the same way. At the Chancellor mansion, Billy complains about Ashley always siding with Jack. Ashley suggests that Jack has a good reason to rip into Billy. She adds that Billy should steer clear of Jack and Phyllis. Ash storms out and Neil enters. He warns Billy about the danger of the path he’s headed down. Other “Young and the Restless” spoilers say Phyllis will try to reach out to Jack again. At the Abbott house, Phyllis begs for forgiveness and wants to repair the damage. Jack doesn’t think their marriage can be saved. He snaps that he forgives her, so she should just move on. Jack shouts that Phyllis should leave, but she follows him up the stairs as they argue. Nikki states that she offered Phyllis some guidance. She doesn’t think Phyllis should stop trying to make this right. Ashley thinks that’s horrible advice. She believes Phyllis and Jack need to go their separate ways. Back at the club, Neil has a conversation with Hilary, Devon and Lily. They’re all worried about Jack and how he’s handling this. Hilary is fearful of Jack’s next move. Y&R rumors hint that some unexpected drama awaits. Stick with the CBS soap to see what’s in store.